Xiaomi is the leading mobile phone manufacturer, which has now launched the new handset, Redmi 4X and the launching ceremony has been conducted at Ava Garden, Faletti’s Hotel, Lahore on Friday. The event was hosted by the well known entertainer and musician, Taimur Salahuddin and it is also featured witht the performances of Noori and Nescafe Basement artist, Altamash Sever and the special guest was Mira Sethi. This smart phone is the upgrade from the vanilla Redmi 4 due to its design and performance. This handset is provided with all metal body and the fingerprint sensor at the back. The IR blaster is included for remote controlling the TVs, ACs and other appliances. This smart phone has 5” 720p (1280 x 720) IPS LCD display. The handset has the density of the display at 293 PPI. Xiaomi Redmi 4X is provided with octa-core Qualcomm Snapdragon 435 processor and it is classified as mid range processor. It is provided in the market in 3 different models with 2/3/4 GB RAM and 16/32/64 GB of the internal storage. The microSD card can be added in this handset for the support up to 128 GB expandable storage. 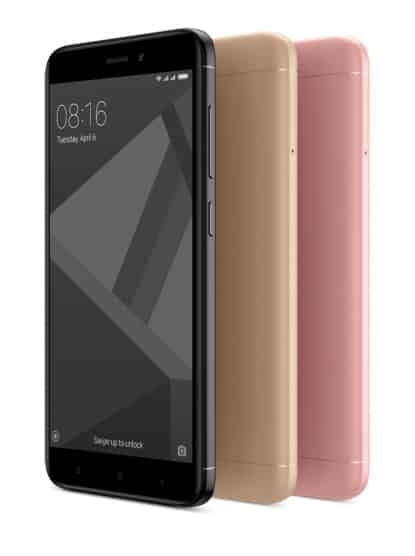 For OS, the Redmi 4X is featured with same old Android 6.0 Marshmallow with new version of MIUI. The skin of the handset is similar to iOS interface in Apple phones with better customization options and accessibility. The smart phone, Redmi 4X is added with 13 MP camera with Phase Detection Autofocus, HDR and LED flash and it is also provided with 5 MP shooter with beauty mode and other tidbits. This handset is also added with massive 4100 mAh battery and it is coupled with small 5” 720p display and the Snapdragon 435 SoC the battery can easily last for 3 days of medium usage. The handset, Xiaomi was officially unveiled the Redmi 4X in Pakistan and it is launched in the market at the price tag of Rs.18,900.